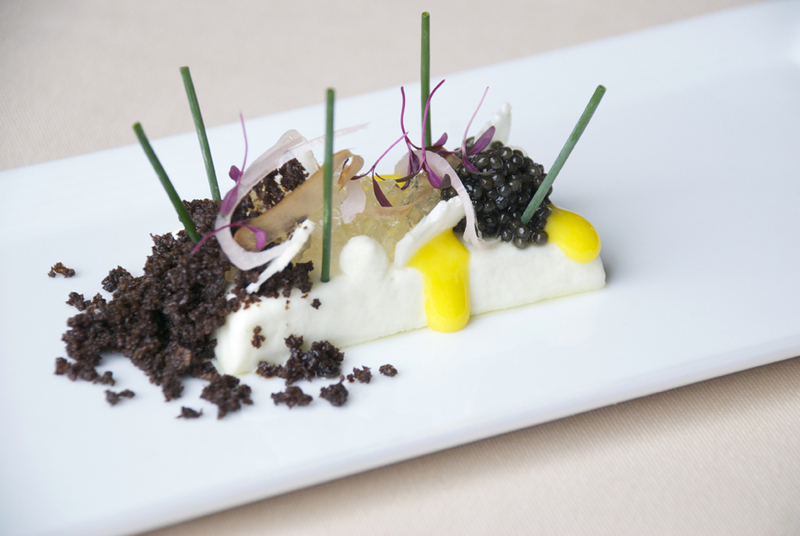 Executive Chef Michael Corvino brought a starter of cauliflower-infused panna cotta accompanied by a spoonful of osetra caviar, carefully arranged into a tiny cluster of black pearls, to my table at The American Restaurant. Moments earlier, I watched him assemble this dish in the kitchen. Corvino invited me for a visit after he had settled in at the restaurant. His July arrival marked a time of transition at The American. Corvino’s initial focus was to update the line-up of dishes with summer well under way while looking ahead to fall, the first full season when he could implement his ideas and create a cohesive menu. Gradually, summer tomatoes and delicate greens yielded to autumnal dishes such as Duroc pork served with persimmon mustard, Szechuan peppercorn, savoy cabbage and black garlic. Cauliflower-infused panna cotta with osetra caviar. As a whole, Corvino’s fine dining dishes were refined but accessible. His culinary approach reflected a keen emphasis on the interplay of ingredients as he juxtaposed texture, flavor, shape and color. The final dish maintained a sense of harmony, enticing me to explore without the need to pause and figure it out. He transformed the traditional presentation of a dish without veering into molecular wizardry. For example, this caviar dish shunned the culinary canon of arranging portions of minced onion, egg and capers around spoonfuls of roe. Instead, the panna cotta and caviar appeared as an edible landscape. Golden dots of egg yolk, gently cooked at a precise temperature of 65 degrees, added richness and color. Pale amber shards of dashi – a kombu and bonito broth that forms the foundation of miso soup – fortified with gelatin here, added pleasing umami to the dish. Dark crumbs of pumpernickel bread, a nod to the traditional use of toasted bread served with caviar, contributed crunch as a counterpoint to delicate, silky textures. Slim stalks of chives and traces of pickled shallot invited a sharp bite of acidity. Creme fraiche, another standby served with caviar, was tempered with citrusy yuzu to offset the overall creaminess. Finally, slivers of cauliflower florets reinforced the earthy notes of the panna cotta and tied the dish together. Only the taste of each spoonful surpassed the visual presentation. Corvino execution of the dish demonstrated forethought and mastery. By re-working a classic combination of ingredients, he challenged expectations of what a dish was supposed to be. 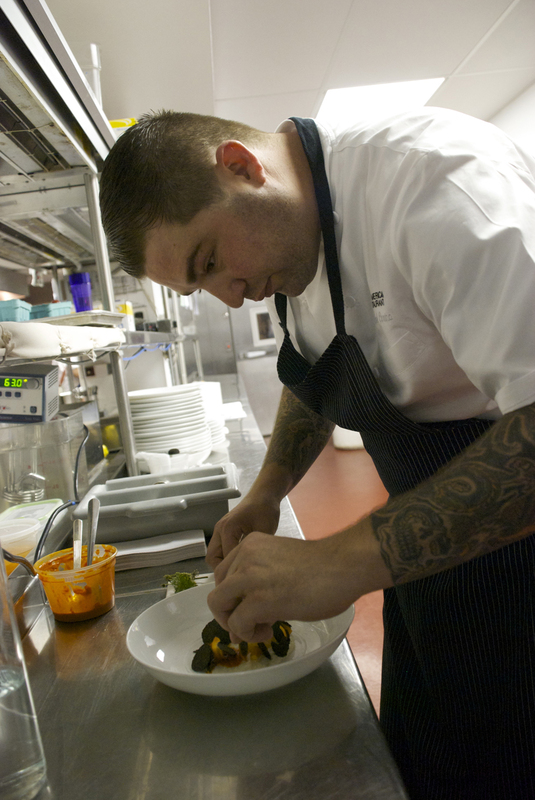 Chef Michael Corvino in The American Restaurant kitchen. Originally from Walla Walla, Washington, Corvino worked at several restaurants before he landed a position at the Marcus Whitman Hotel in his hometown. Over his career spanning more than a decade, he graduated to successive stints in kitchens at the Peninsula Hotel, the Ritz Carlton Resorts and The Nines. Later, he was appointed Executive Sous Chef of the Rosewood Mansion on Turtle Creek in Dallas, Texas prior to his present tenure at The American Restaurant. For example, he recently ordered hidden rose apples from Dragonberry Produce in Clackamas, Oregon. At The American, he prepared the aromatic apples with sour apple sauce, shaved white truffle and a touch of olive oil and fleur de sel. He also shipped in sturgeon from Idaho and introduced it on the menu. “It is a meatier fish. Sturgeon is where our caviar comes from,” said Corvino, comparing the fish to salmon. The added explanation helps to increase the comfort level of diners and build trust. 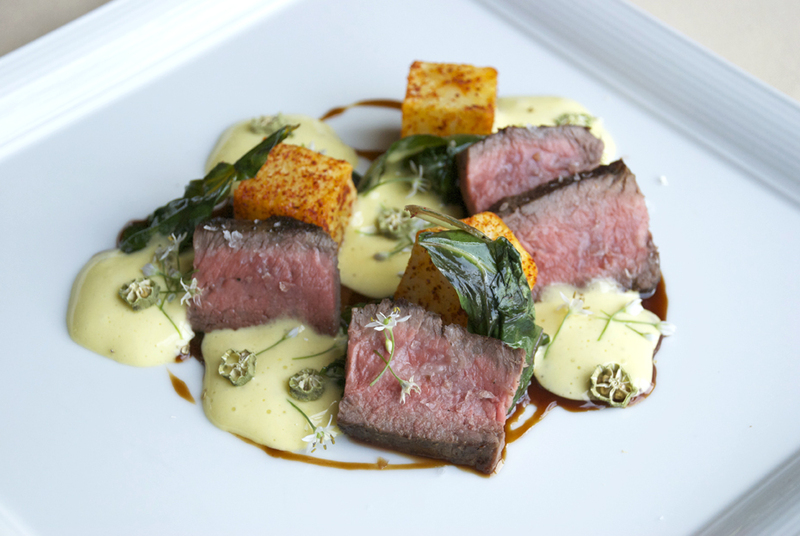 Corvino is no fan of the term “farm to table,” especially as it applies to The American. He pointed out that a certain level of fine dining, it is a given that food is sourced from local farms, butchers and vendors when available. Again, quality still matters most. 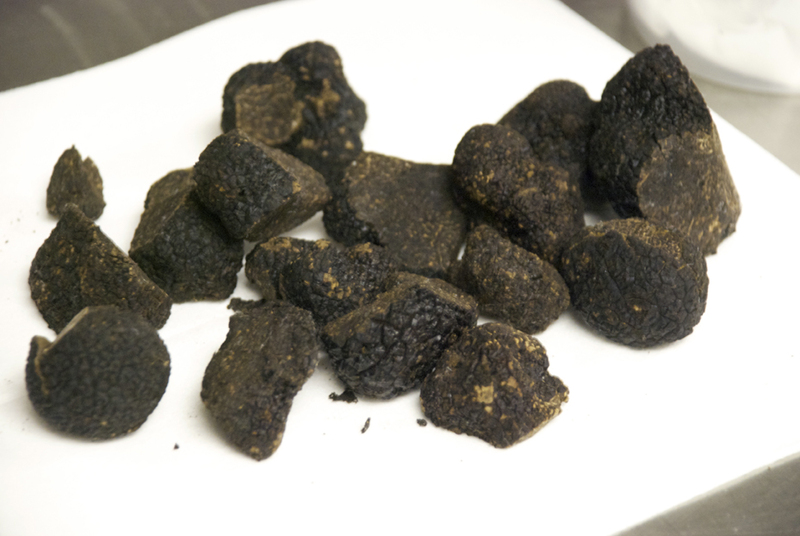 Hidden rose apples, matsutake, or pine mushroom, and Australian perigord black truffles are examples of specialty foods found in his pantry that he carefully sources to obtain the best quality. He just received blocks of katsuobushi blocks and a shaver that he ordered from Japan eight weeks ago. Katsuobushi is dried, fermented and smoked skipjack tuna, or bonito in some cases, used with kombu, or dried kelp, to make dashi – the flavor-filled pieces found in Corvino’s caviar and panna cotta dish. Corvino’s cuisine doesn’t depend on exotic fare. Homespun ingredients prepared with a twist also make appearances. 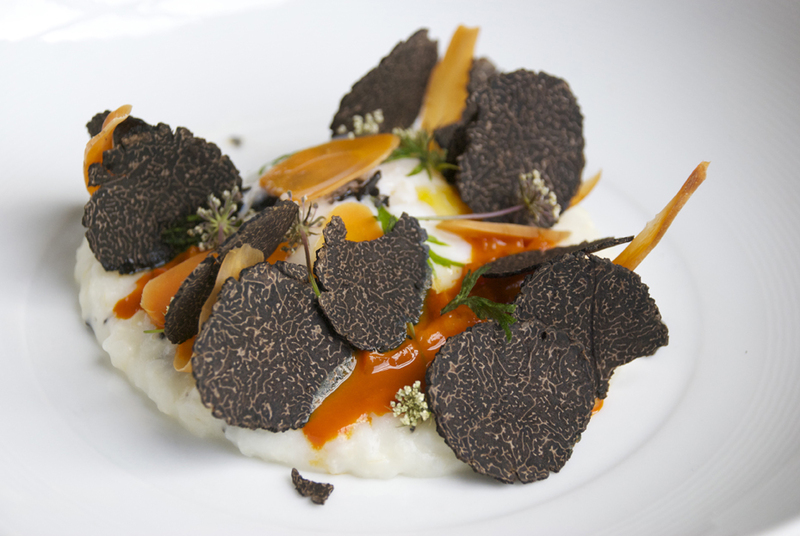 Shaved wafers of the subtly earthy-smelling black truffle were paired with a soft-cooked egg, carrot marmalade, truffle salt and creamy grits. Carrot blossoms, dried carrot tops and raw shaved carrot evoked the anchor ingredient with a panoply of shapes, textures and concentrated aroma. The first forkful became an introduction to a carrot’s quintessential essence as it greeted the senses. The grits communicated a sense of being taken care of; it was comfort food with a pedigree. Corvino delivered a third dish that underscored his practice of incorporating Asian flavors into dishes. A strip loin of Japanese Akaushi Kobe beef, ordered from Arrowhead Specialty Meats in North Kansas City, was seasoned with salt and pepper and seared. Served with a confit of potatoes and herbs, tomato jus and fermented Korean chili paste, each bite impressed with its depth of flavor. Smoked garlic Bearnaise, a reduction of white balsamic, sweet garlic blossoms, bits of dried okra slices and fried Swiss chard added complexity to the dish. The meat entree didn’t pack a heavyweight punch to the gut. It delivered big, bold flavor, easily paired with a red wine or robust beer, without inducing a subsequent food coma. For instance, Corvino mentioned Piedmontese chuck flap that appears on the current menu as a fun spin on beef and broccoli, a Chinese-American classic dish. Corvino braised the beef and prepared a version of oyster sauce that incorporated three types of soy sauce, citrus, ginger, lemongrass and other ingredients. He also whipped up XO sauce from dried shrimp, dried scallop, Chinese sausage, garlic, shallot, ginger, and, well, you get the idea. This goodness is served with salt water-poached Chinese broccoli, plus pickled shallot and crispy jasmine rice. Chef Corvino’s knowledge of ingredients, coupled with his mastery of technique and creative instincts, results in an idiosyncratic style of food. Fine dining at The American Restaurant isn’t merely the product of using the most expensive ingredients. Corvino excels at taking the best quality ingredients available and preparing a dish that elevates flavor and presentation above the mundane and expected. It’s making ho-hum beef and broccoli into a lively, interesting meal that appeals the senses and sidesteps perfunctory versions another restaurant might deliver. 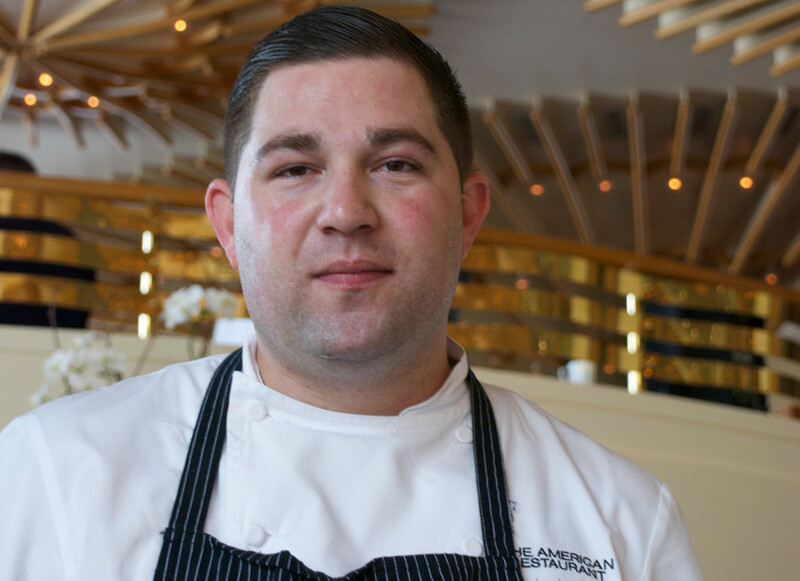 With the first six months under his belt at The American, Corvino is preparing to introduce some exciting changes to the menu next year. He hints at development of a new menu format that, let’s say, will change how dishes are presented to guests. Next year promises to be an interesting adventure at The American, where Chef Michael Corvino produces bold, elevated food that reassures and rewards at the same time. 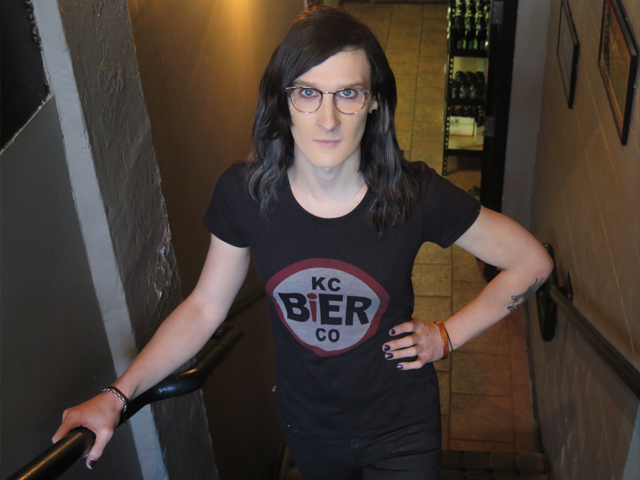 Between July 2011 and December 2012, I photographed 19 chefs and restaurant owners and wrote profiles about them for KC Originals. During that period, I also photographed numerous dishes with accompanying recipes for the web site. The brief profiles explore the subject’s culinary background, training, influences, and philosophy. 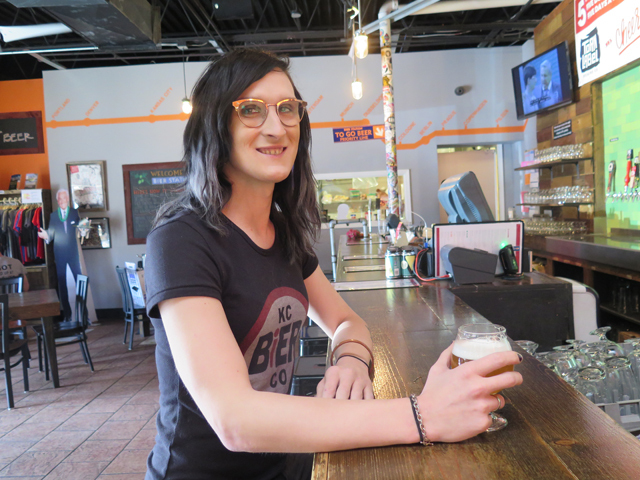 The purpose is to inform diners about chefs and local owners at these independent restaurants in the greater Kansas City area. The recipes and profiles assist diners when scouting out local places to eat or dishes to try. 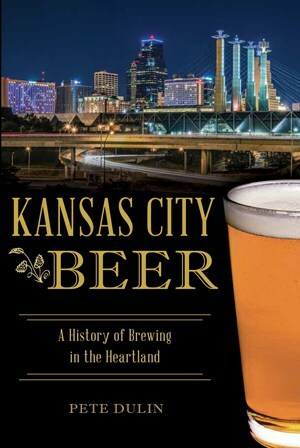 What I loved about these assignments was meeting professionals in the restaurant industry and supporting Kansas City’s local businesses and culinary scene. 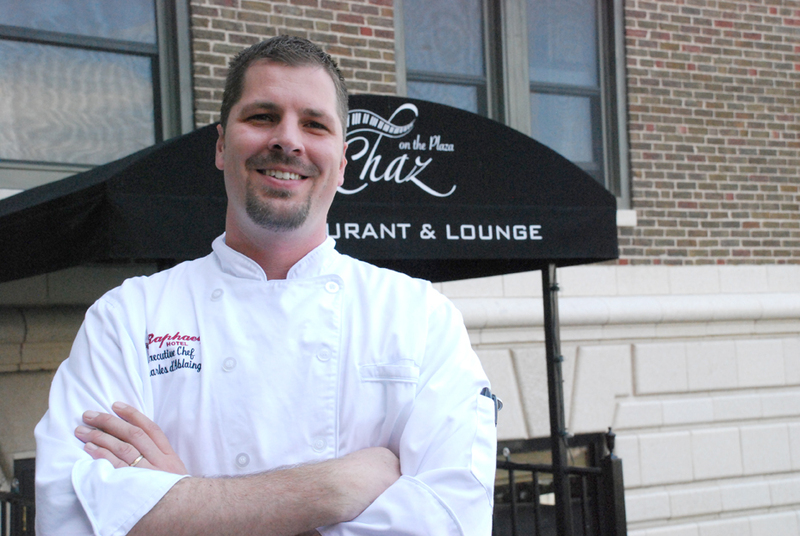 Pictured above: Chef Charles d’Ablaing, Chaz on the Plaza. 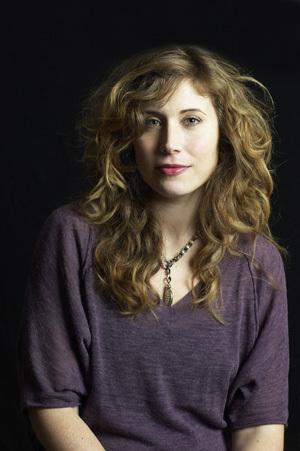 Raquel Pelzel is an award-winning food writer and has written and collaborated on more than a dozen cookbooks. Her work has appeared in Saveur, The Wall Street Journal, Cook’s Illustrated, Fine Cooking, and many others. At the time of the inteview, she was senior food editor for Tasting Table. She writes the blog raqinthekitchen.com. Sofia Perez, editor-at-large for Saveur, recommended that I contact Raquel for the next installment of my series where I ask food writers, “What is Good Food Writing?” Sofia wrote the first thoughtful response. Stay tuned for more to come. Since Raquel’s expertise and experience lies in cookbook writing and recipe development, she proposed discussing that area of food writing as an alternative to examining my central question. I gladly accepted her offer. Turns out that Raquel’s food writing career began in her hometown of Chicago with a few twists and turns. 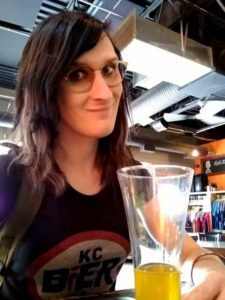 Following her instincts, she decided to attend culinary school and headed to the School of Natural Cookery in Boulder, Colorado. She learned about cooking healthful whole foods to sustain a vegetarian diet. Afterward, she returned to Chicago to finish college and then landed a job in publishing as an assistant editor at Consumers’ Digest Magazine where she wrote about health and travel. She met her future husband and they moved to Boston, his hometown on the East Coast. While working for a healthcare newsletter, Raquel nursed second thoughts about a baking career. She worried about earning enough money to make a living, but decided to go for it anyway. Raquel wanted to marry her interest in food with writing. Opportunity knocked when she saw a job opening at Cook’s Illustrated. She wrote a story and made multiple versions of a dish for the interview. Tuna noodle casserole, no less. She got the job and began her career as a professional home cook, developing and testing original recipes and cross-testing and vetting recipes from some of the best chefs in the world. The process of writing recipes and developing a cookbook is complicated and involves several areas of expertise. Raquel offers several pieces of advice for aspiring cookbook writers or anyone writing a recipe for publication. • Have the recipe(s) tested. “At Tasting Table [where Pelzel currently works], we prepare recipes from chefs and cookbooks constantly. It’s pretty amazing how many recipes don’t work—it’s my job not just to fix them, but to make them an accurate representation of the chef and the food he or she serves,” says Raquel. One of Raquel’s first cookbooks was a project for Williams-Sonoma, Williams Sonoma: New Flavors for Dessert (Oxmoor House, 2008). She was hired to develop the recipes and write the book. The publisher was very involved as were the executives at Williams-Sonoma, and before going into the kitchen, Raquel had to have all of the ingredients and techniques for her recipes approved. She learned to be flexible with recipe development. 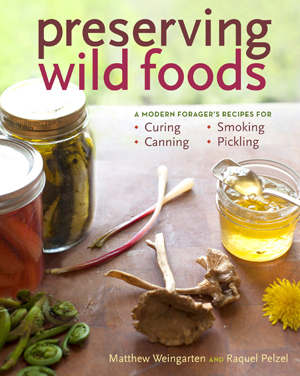 Check out Pelzel’s other work including Masala Farm, a collaboration with Chef Suvir Saran (Chronicle, 2011), and Preserving Wild Foods with Chef Matthew Weingarten (Storey, 2012). Self-titled BBQ Queens and prolific cookbook authors Judith Fertig and Karen Adler will release The Gardener and the Grill for publication (Running Press) in late April 2012. In this interview, they discuss their latest cookbook and share recipes such as Grilled Peach Halves with Lemon Balm Gremolata. The Gardener and the Grill is a grilling guide for gardeners, seasonal eaters, and anyone eager to learn how to grill vegetables and even fruit–not just during the summer months but all year long. In addition to seasonal recipes, the book offers tips on grilling for preserving, a burgeoning “griller’s pantry” of rubs and versatile sauces, and more than 100 vegetarian recipes. The authors are experts on grilling and barbecuing as demonstrated by their numerous cookbooks such as BBQ Bash, 300 Big & Bold Barbecue Recipes, and Weeknight Grilling. The duo has appeared on the Food Network and Better Homes & Gardens TV, and they both share their skills in grilling classes that have reached over 75,000 students. 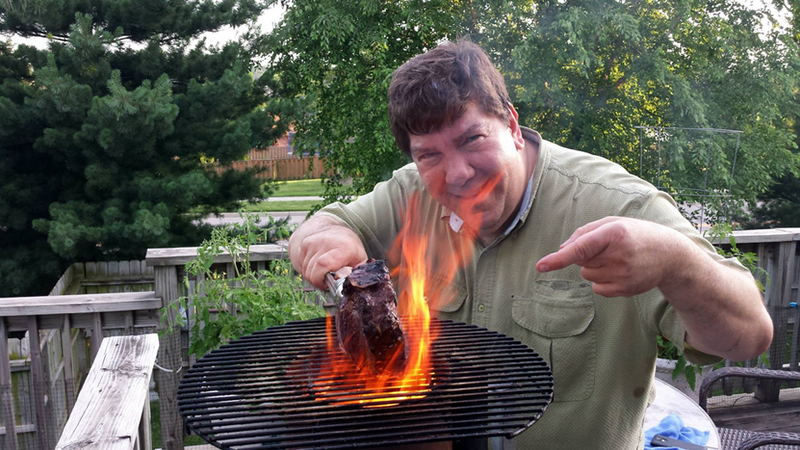 Pete: What’s behind the premise of your latest cookbook, The Gardener and The Grill? Judith: Both of us love to garden and both of us love to grill, so putting the two together in a book was a natural. Pete: What inspired the idea for this book? Judith: As women in barbecue, we think about what we like to eat that is beyond the parameters of meat and potatoes. Our Fish and Shellfish, Grilled and Smoked; 25 Essential Techniques: Grilling Fish; and 25 Essential Techniques: Planking feature more “finesse” barbecue. We love fresh flavors and colors, so grilling from the garden became our current project. Pete: What recipes do you suggest for the grill in fall, winter, and spring as produce availability changes with the season? Karen: In fall, it’s wonderful to grill apples and pears as well as root vegetables, winter squash, and hearty greens like Swiss chard and kale. There’s a way to grill just about everything. In winter, it’s more closing the lid on the grill or smoker and smoking potato dishes, grilling brussels sprouts (which are fabulous) or grilling greens to serve with a warm cranberry vinaigrette. In spring, it’s all the wonderful asparagus, leeks, snow peas and edamame in the pod, green onions, and fingerling potatoes. 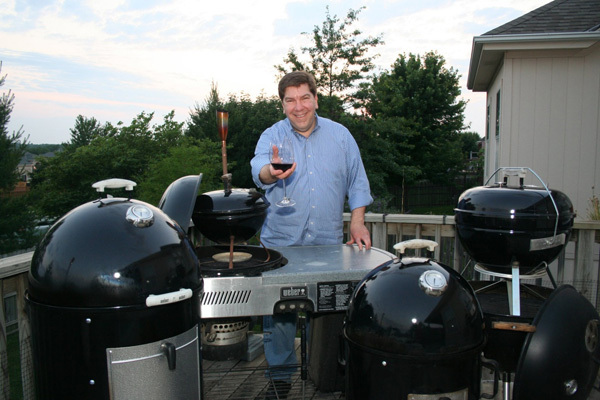 Pete: What are some items in the “griller’s pantry” that you recommend having on hand? Karen: The essential ingredients are olive oil, salt and pepper. Beyond those, you can stock Dijon mustard, bottled hot sauce, wine vinegars, dried herbs and spices. Pete: Can you share some background about how you develop, test, and refine recipes? Judith: We both save recipes that we come across and keep a stash of them. We’ve also written quite a few books, so we have a body of work on which to draw. We both seem to like the same flavors and the idea of maximum return for ease of preparation, so we’re on the same page with that. We sit down and make a list of ingredients or recipe concepts we want to feature in a book, then create or tweak a recipe, then test it. With The Gardener and the Grill, we wanted to make sure we included as many herbs, vegetables, and fruits from the garden as we possibly could in ways that made sense and tasted great. 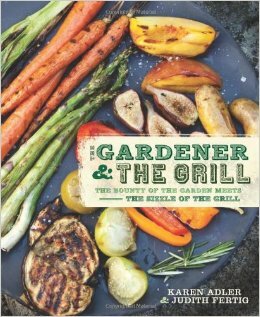 Pete: What does this book offer for the novice gardener and/or griller or someone completely inexperienced in either/both areas? 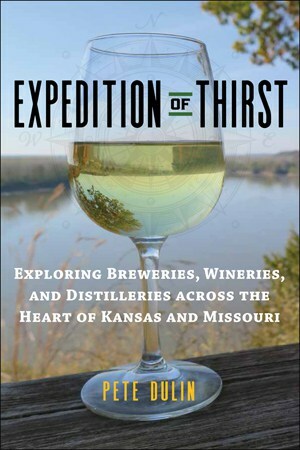 Is this book a good entry point or do you suggest another title in your catalog? Karen: The Gardener and the Grill is for the novice as well as the experienced gardener or griller. If you only have a pot of cherry tomatoes on your patio and have only threaded them on a skewer to grill, you can use this book. If you have a big garden, you can extend your gardening repertoire by growing and grilling new varieties. 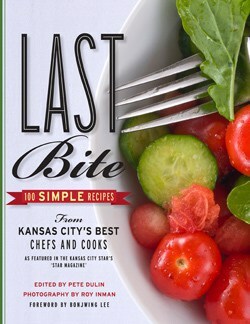 Pete: Favorite recipe in the book? Judith: That’s hard to choose. I have a new one every day. Today, it’s Grilled Summer Slaw with Gorgonzola Vinaigrette. But I also have a hankering for Warm Honeyed Blackberries with Grilled Pound Cake. Pete: Where can the book be ordered and purchased besides Amazon, locally and nationally? Is it available as an eBook? Karen: The Gardener and the Grill is at Pryde’s, A Thyme for Everything, The Kansas City Store, Kitchen Thyme, Webster House, Williams-Sonoma, Anthropologie, Barnes and Noble. It is available in ebook format. If you grow pole beans, you know that at first glance, you have only a few beans, and then suddenly there is an onslaught. 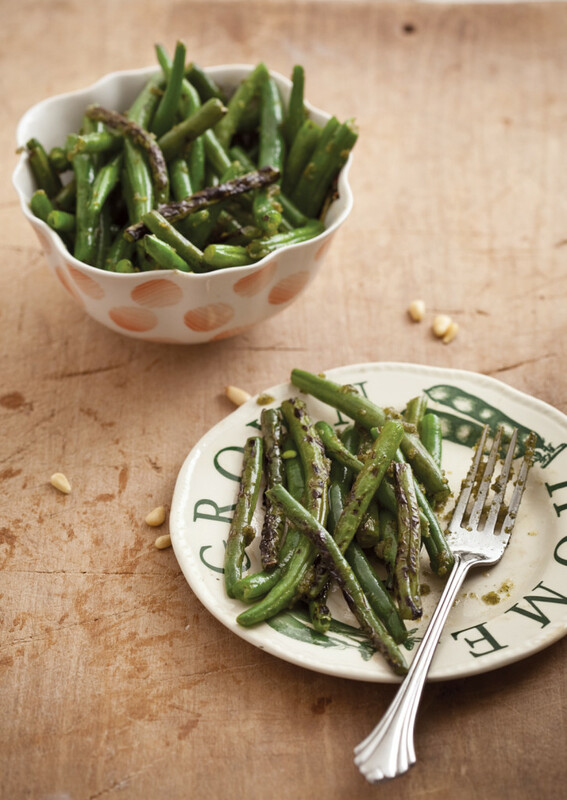 That’s when bean varieties like the green Blue Lake or the yellow wax beans can be stir-grilled with a bit of olive oil for a very simple yet satisfying dish to use the surplus of beans. When you’re in the mood for a more robust sauce, try this lemony pesto tossed with the grilled beans right before serving. Serves 2 to 4. For the Lemon Verbena Pesto, combine the lemon verbena, garlic, cheese, and nuts in a food processor and pulse to puree. Slowly add the olive oil with the processor running until the mixture thickens and emulsifies, about 1 minute. Season to taste with salt and pepper. The pesto will keep in the refrigerator for 7 to 10 days or it may be frozen for up to 3 months. This recipe is very simple, yet full of flavor. A traditional gremolata has parsley, lemon zest, and garlic, but this is a sweeter version, delicious with fruit. If you don’t have lemon balm in your garden, substitute mint and add more lemon zest. If you use a Microplane grater, you get the flavorful yellow part of the lemon rind without the bitter white pith. By chopping the herbs with the lemon zest, the flavors blend together better. Serves 4. Prepare a medium-hot fire in your grill. Chop the lemon balm, mint, and lemon zest together until very fine. Sprinkle a pinch of salt over the leaves and chop again. Set aside in a small bowl. Place the peach halves cut side down on the grill. 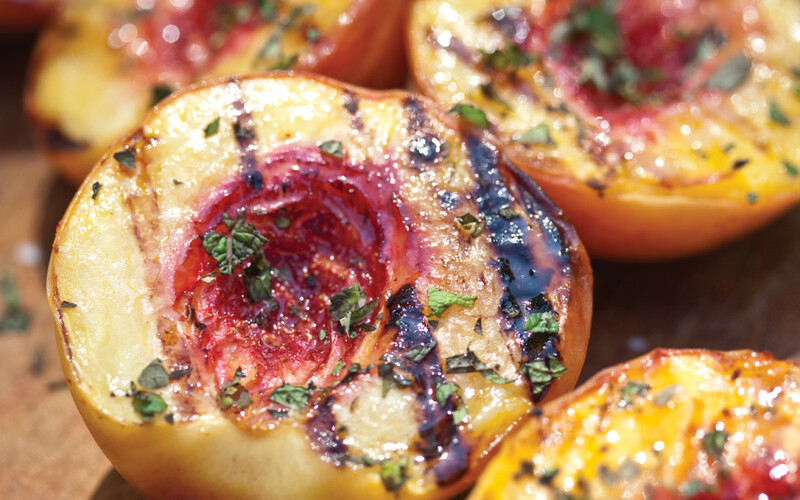 Grill for 4 to 6 minutes, turning once, until the peaches are tender and blistered. To serve, place 2 peach halves in each bowl and sprinkle the Lemon Balm Gremolata over all.